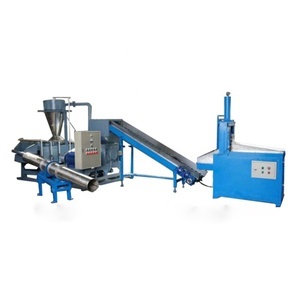 Henan Recycle Environmental Protection Equipment Co., Ltd.
Weihai Allluda Environmental Protection Equipment Technology Co., Ltd.
Zhengzhou Dahlia Commerce Co., Ltd.
Baoding Saiderui Machinery And Equipment Manufacturing Co., Ltd.
3. The design of separator and dust collector is handy for movement or transport. 4. The rotor of the grinder is alternating, leading to more efficiency, faster discharging, lower noise and steadier running. 7. 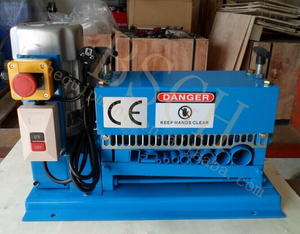 Dust-collector can prevent the leak of dust, the dust-cleaning rate can reach 99%. The crusher blade of high quality would change the wires or cable into particles . After crushing the mixture of copper and plastic will be blow to the separating process by a high pressure blower. Because of different gravity, the copper clad is easily floating up and collected by the blower . 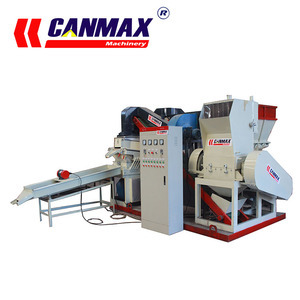 Henan Excellent Commercial & Trading Co., Ltd.
Henan Maxim Machinery Equipment Co., Ltd.
Introduction of Dry Type Copper wire chopping machine : 1) C an crush the household wire, telephone wire, computer wire, automotive wire and cables within 0.1-30mm into granulator. 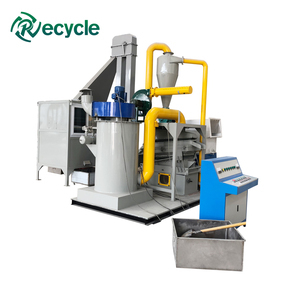 Working Principle of Dry Type Copper wire chopping machine After the separation equipment to complete the cable broken in the process of copper and plastic separation and recovery. 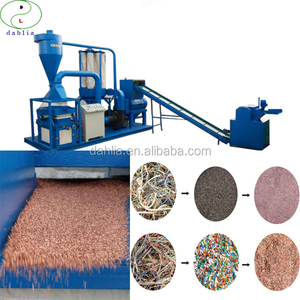 Working process of Dry Type Copper wire chopping machine 1. Crushing process Put waste copper wire into crusher to grind the wire into granulator. We have a professional shipping department, they will try them best to save your container quantity. For some typical problems, our rigorous installed engineers also will do some certain installation debugging training, etc. For some typical problems, our rigorous installed engineers also will do some certain installation debugging training, etc. 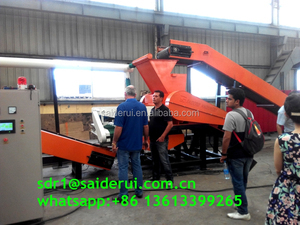 The mixture will directly fall into vibrating screen after be crushed, and will go through separating blower, gathering blower and accessorial blower. With screen box straight shock excitation, the sheath and core will separate, and get copper particles, plastic pellets and mixture from different ports. The vibrating screen and separating blower will be controlled by transducer, which can adjust frequency and the air value according to different conditions. Henan Qimai Mechanical Equipment Co., Ltd.
2The intelligent operation is convenient and makes the equipment in stable operation. 4)The crusher, sorting equipment and dust collecting devices are platforms combined type, which make the equipment easy to move and transport. (4) During the operation, we can offer the technology service freely if the user needs to adjust the layout and application. It has double blades and double rollers. This wire stripper was desinged to be affordable,durable and user friendly. It is practicable and easy to handle. Henan Doing Mechanical Equipment Co., Ltd.
Alibaba.com offers 1,358 wire chopping machine products. About 52% of these are other metal & metallurgy machinery, 1% are food processors, and 1% are meat bowl cutter. 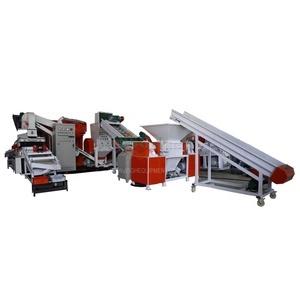 A wide variety of wire chopping machine options are available to you, such as free samples, paid samples. There are 1,360 wire chopping machine suppliers, mainly located in Asia. The top supplying countries are China (Mainland), India, and Turkey, which supply 99%, 1%, and 1% of wire chopping machine respectively. 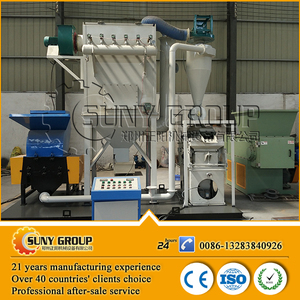 Wire chopping machine products are most popular in Northern Europe, Domestic Market, and North America. You can ensure product safety by selecting from certified suppliers, including 97 with ISO9001, 63 with Other, and 6 with ISO14001 certification.